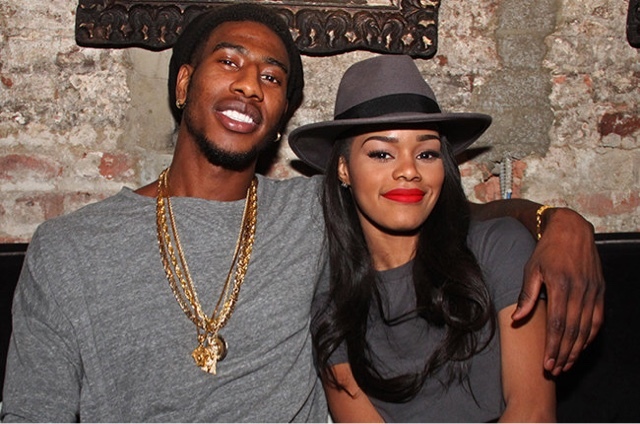 Congratulations to Teyana Taylor and fiancé Iman Shumpert, who welcomed their new baby girl Iman Tayla Shumpert. Teyana took to her Instagram account to share the amazing news with fans and revealed their bundle of joy arrived with a bang on their bathroom floor, with dad, Iman delivering! "On Dec 16th at 6:42am in our bathroom Junie decided she wanted to take her first breath into this world. She came out as a wonderful surprise to everyone! Not knowing I was in labor until I felt her head...it took two ten count pushes with my fiancé playing Dr and she entered this world into his bare hands! Eyes full of tears and barely able to speak to the emergency operator @imanshumpert tied a pair of red headphones around the umbilical cord and the ambulance made there grand entrance 5 min later. She opened her eyes right away, gazed into mine and never cried! He handed her to me wrapped in our bath towel and wiped her face for me to see what LOVE really is. She has blown Christmas away! Our family is complete. Her blueprint will be unmatched. Welcome Iman Tayla Shumpert Jr. Mommy carried you. Daddy delivered you. #MeetTheParents we love you baby girl"